When I started working in Lush, I realised how bloody old I'd got. There I was, surrounded by 16 year olds in their first jobs, and I was a full decade older than them. Even in the blogging world, there are a lot of you lovely folk who are quite a bit younger than me, and yet loads of you have accomplished a lot more than I have. 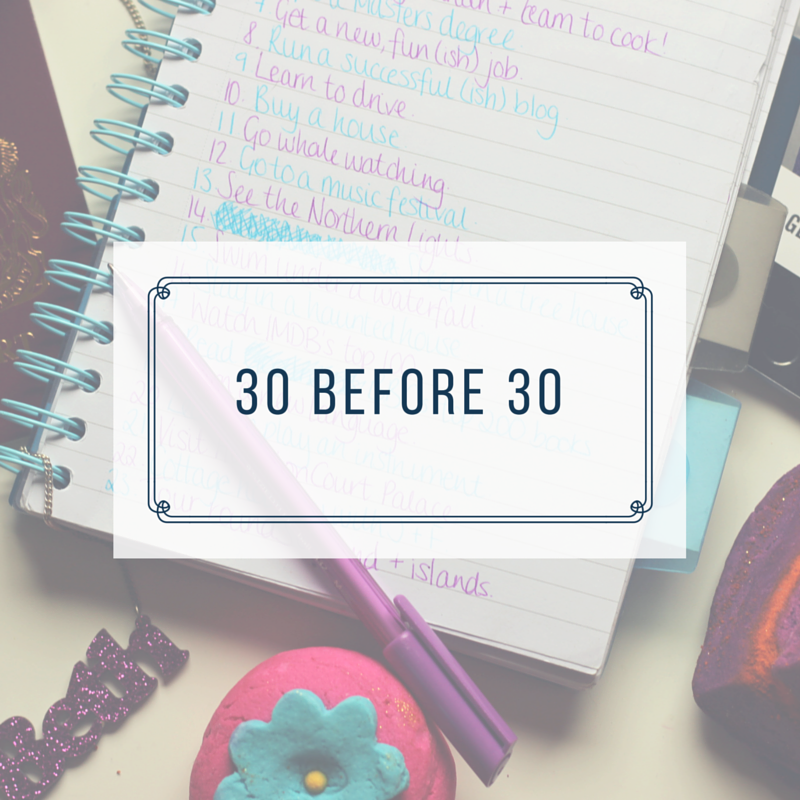 So I decided that instead of letting it get me down, I'd use my impending 30th birthday as inspiration, and come up with a few ideas on what I want to achieve by 30th October 2019 (put it in your diaries...) I'm almost certain I won't do any/all of them, but it's worth a shot. 1. Lose weight - the usual shebang. I want to get fit and healthy and stop being a cave-dwelling troll. 2. 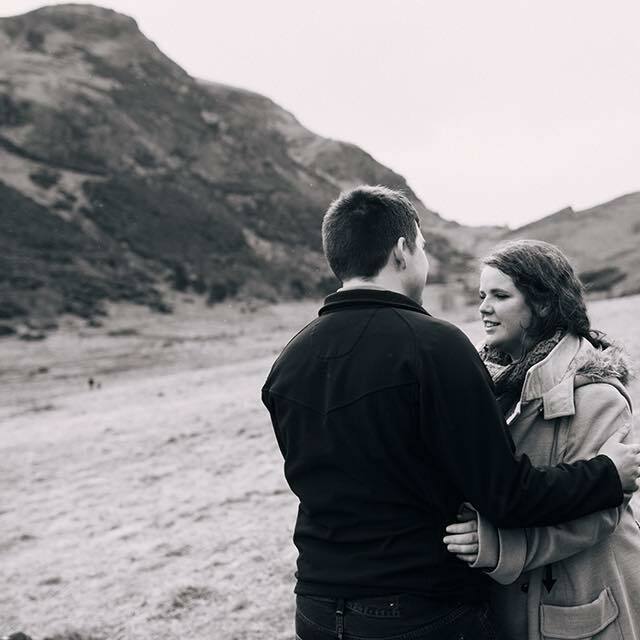 Walk the West Highland Way - I'm sure I've mentioned this before, but my husband managed to drag me on precisely one day of this long distance walk. I'd like to do it just to prove to him I can. 3. Run a 10k - frankly the idea of me running 10 metres is pretty laughable, but we'll see. 4. Climb Ben Nevis - I've literally failed at climbing one of the smallest munros, but hey ho, why not try the biggest? 5. Become vegetarian - This is the only one I'm remotely confident on really. I hate that I eat meat, it will definitely change. 6. Get a Masters degree - after graduating in Psychology I always wanted to go back and get my Masters in Forensic Psychology. Looks wholely unlikely for a number of reasons but a girl can dream. 7. Get a new, fun(ish) job - Almost every job I've worked in has been a horror story (I may actually do a post about this if anyone's interested?) so I'd like to get a job somewhere where my co-workers don't terrify me. 8. Continue with the blog - I would like to make this blog as successful as it can be! 9. Learn to drive - my driving instructor made me cry when I was 17 and I never went back. I need to do this one though! 10. Buy a house - this is equal parts exciting and terrifying. 12. Go to a music festival - again, just to say I can really. My anxiety makes the idea of festivals absolutely terrifying but I'd like to try it. 13. See the Northern Lights - my brother has some amazing photos of them from his trip to Norway and I am so bloody jealous. 14. Sleep in a tree house - This just looks so fun. 15. Stay in an igloo hotel - I honestly can't understand why anyone wouldn't want to stay in a big igloo with a glass ceiling?! 16. Swim under a waterfall - preferably somewhere hot, but I'm not fussy. 17. Stay in a haunted house - I watched a lot of Most Haunted in my teens. 18. Watch IMDB's top 100 movies - I am really uncultured when it comes to films, and I haven't seen a lot of the 'classics'. 19. Read Goodreads top 100 books - I bloody love reading, and if you have Goodreads you should add me here. 20. Learn a new language - I'm thinking Italian...? 21. Learn to play an instrument - hopefully Blair will help me with this one. 22. Visit Hampton Court Palace - I am OBSESSED with Tudor history, and the fact I've not been here makes me all kinds of sad. 23. Go on a staycation with Jamie & Fereuse - this is happening later this very week and I am so, so excited! 24. Tour around Scotland's islands - I'm slowly making my way around them, but there's loads I'd like to see. 25. Visit new places in Italy - I've been to Rome three times, and also a beautiful little town called Montalto delle Marche, but I'd like to see a lot more of Italy. It's so beautiful, one of my favourite countries for sure. 26. Visit Ireland - I'd really like to spend some time in rural Ireland, my great-grandfather was Irish and us Celtic nations seem to have quite a lot in common. 27. Go stargazing in Sark - Sark is one of the smaller Channel Islands, but they are a Dark Sky Community, meaning that there is very little light pollution and naked-eye astronomy is possible. It looks so cool! 28. See the Blue & Green Grottoes near Split, Croatia - the water in these caves appears to be, surprise, bright blue and bright green. It looks magical. 29. Visit Iceland and see a geyser - as many times as my Geography teacher father tried to explain geysers to me, they just blow my tiny wee mind. I'd love to see one up close. I totally understand where you are coming from, Im approaching 30 and Im starting to wonder where my life is going! You have some great things on your list that Im going to take inspiration from. I live near Hampton Court and have been lucky enough to visit a few times, its really great fun! Yeah it's just really started dawning on me how quickly time is ticking along! I genuinely still think I'm 17 half the time, I wish! I'm so jealous you get to go to Hampton Court, my best friend lives in London and every time she goes I get really envious of her photos. Soon, it'll definitely happen soon! Love this list! You should definitely go for a Masters in Forensic Psychology! I love all of these! I'm nowhere near 30 yet but I always set goals, especially ones I'd like to achieve in the next 15 years. These are fantastic goals and you can absolutely get your masters!!! Fab list. A friend recently showed me hers and I really want to write one myself but no idea where to start! Ten Things That I'd Do Differently.